The Angriest: Star Trek: Voyager: "Persistence of Vision"
It is 30 October 1995, and time for another episode of Star Trek: Voyager. As Voyager nears the territory of an isolationist civilization, Captain Janeway (Kate Mulgrew) is ordered by the Doctor (Robert Picardo) to take some much needed leave to relax and de-stress. She attempts to enjoy a gothic holo-novel - only to question her sanity when elements from the novel begin appearing outside of the holodeck. "Persistence of Vision" is a faulty episode. It lacks focus, its plot wavers incessantly, and it really seems to be at loss as to how to effectively use the entire regular cast, but it also has a fairly strong concept behind it and a nicely unsettling adversary once everything is said and done. It's imperfect television, but ultimately entertaining television. I seem to be saying that a lot about Voyager's better episodes. This episode marks the final outing of Janeway's gothic holo-novel. The writing team was getting feedback that viewers were not warning to it, denying future episodes of Carolyn Seymour's creepy Mrs Templeton or ever finding out what's hidden inside the manor's attic. I'm actually slightly sad to see it go, because with most of her screen time taken up with command activities it was nice to see another side to the character. I think it enriched her rather nicely. 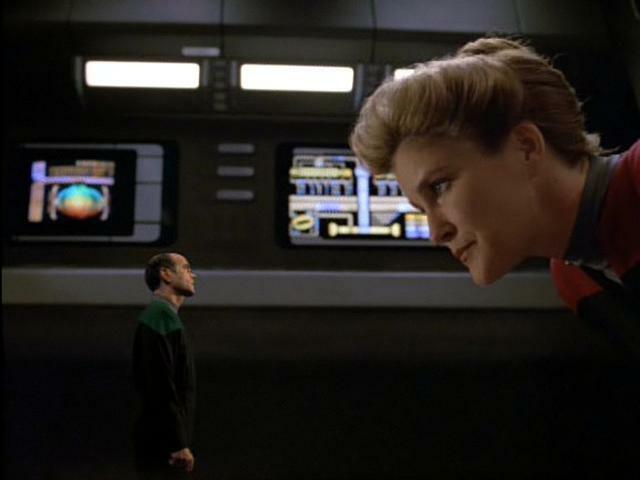 "Persistence of Vision" kicks off with Janeway seemingly hallucinating elements from her holo-novel, but after a while expands to showcase dream sequences and hallucinations by the entire Voyager crew. It's here where the episode loses focus, particularly when it comes to one or two weirdly misjudged sequences. A scene in which Torres (Roxann Biggs-Dawson) fantasises about a romance with Chakotay (Robert Beltran) doesn't ring true for either character. The revelation of what is causing the incidents could have easily been weak, but a nice sting in the tail winds "Persistence of Vision" up with a twist. Strong direction by James Conway also helps to paper over any of the script weaknesses. This is a cut above the general run of poor episodes on Voyager, and gives Season 2 its third decent episode out of eight so far. The quality ratio rises to 38 per cent.